(CNN) - House Speaker John Boehner marked Pope Francis’ first anniversary Thursday by extending an open invitation to him to address a joint meeting of Congress. Boehner, who is Catholic, noted in a statement that the Argentinian was the first Pope "to hail from the Americas." The Speaker said his teachings, "rooted in ‘the joy of the gospel,’ have prompted careful reflection and vigorous dialogue among people of all ideologies and religious views in the United States and throughout a rapidly changing world, particularly among those who champion human dignity, freedom, and social justice." Boehner’s letter to Francis said the invitation was on behalf of the bipartisan leadership of the House and the Senate. 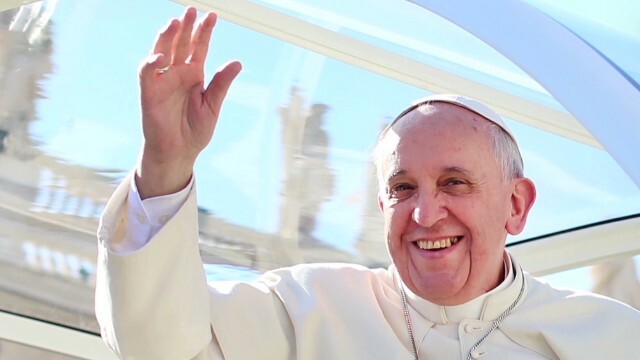 Francis marked his first year as leader of the Catholic Church with a simple message to his nearly 4 million Twitter followers: "Please pray for me." President Barack Obama is scheduled to travel to the Vatican on March 27 for an audience with Francis. Since he took his post last year, Francis has put a major emphasis on social justice. In his statement, Boehner alluded to the political debate about Francis' outspoken comments on the inequities of capitalism. Boehner said the principles Francis emphasizes are "among the fundamentals of the American Idea. And though our nation sometimes fails to live up to these principles, at our best we give them new life as we seek the common good. Many in the United States believe these principles are undermined by ‘crony capitalism’ and the ongoing centralization of political power in the institutions of our federal government, which threaten to disrupt the delicate balance between the twin virtues of subsidiarity and solidarity." The Vatican has not announced any plans for the Pope to visit the United States. Whew, I'm sure he'll have plenty to say to our self righteous tea party congress who profess truckloads of faith while doing their very best to make poverty more miserable than it already is. You could learn A LOT from this pope Mr Bendover. So their "excuse" to get aid to the Ukraine will "inadvertantly" eliminate one of the countermeasures keeping religion from controlling the Government, "Republicans say that to get the measure passed new IRS rules that make it harder for tax-exempt groups to veer into politics must be withdrawn." Any guesses as to where this is heading, ready to kiss your freedom goodbuy when the church takes over? "Boehner invites Pope to address Congress"
If I was a Congressman I wouldn't attend until the catholic church starts paying taxes. I wonder if it'll help the corruption & GOP blockade of everything productive? Great news maybe he can rid Congress of their greed and share his humility with them!!! Unbelieveable how ignorant most Americans are ... blaming the very people they vote for. Happens every 2 years in America: Citizens, neighbors, educators, local political activists, doctors, lawyers, mechanics, run for office. You vote for them. They represent you. Then, since Americans are huge whiny babies, the citizens blame everyone else for their own voting mistake, and blame Congress. Look in the mirror you dumb Americans – YOU are the problem, and Congress represents you 100% perfectly. Pathetic. It's always someone else's fault. BS. Its actually very Christ-like: he's going into a chamber controlled by the Pharisees of the Right. hopefully he can chase the lobbyists out there, so the Koch Brothers had better be wearing their racing flats. The tea baggers will yell, "You lie!" Then call him a socialist Marxist communist. I'd welcome the visit. Both parties claim he speaks for them – let's let him speak for himself. "first USA needs to fire all republicans from congress/senate". I am pope, I approve this message. ricardo1968 said: "Whew, I'm sure he'll have plenty to say to our self righteous tea party congress who profess truckloads of faith while doing their very best to make poverty more miserable than it already is." Oh.....to be a fly on that wall for THAT!!! Great! One delusional mind inviting another delusional mind. What could go wrong with that? I posted a similar comment Rudy (cnn had it for a mid-afternoon snack!). The Pope is a head of state (Vatican) I therefore thought that the correct protocol would've been to issue an invitation to visit the United States and possibly address Congress via the President of the United States, not the Speaker of the House. I hope the pope takes him up on the offer. I'm not even Catholic but if there is any place in the world that could use a good role model its D.C. Indeed Sam and good post ricardo 1968. This Pope is VERY progressive. Very with the times and quite outspoken. Scoot over on that wall and make room for me Sam!